If Bingo Fever wasn't enough, we have another even flashier pattern for you! 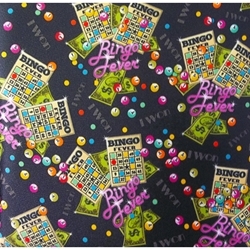 The pattern shows floating cash, bingo balls, and bingo cards along with the words "I Won!" and "Bingo Fever". Alot of flash, pizazz, and bling make this pattern truely vibrant! This double seat cushion has a seat flap on the back. The foam inserts in this double cushion are roughly three inches thick. There is a handle on both ends of the cushion for ease of carrying. Each cushion measures 13x13.5x3". Two of these are fashioned together by 2.5" of patterned fabric.